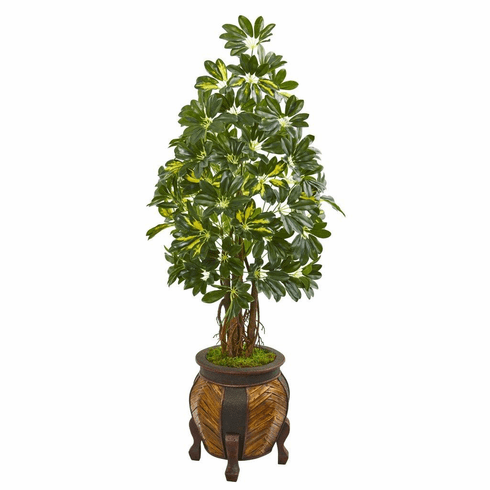 Made from the finest material, this 57” artificial schefflera requires no maintenance to keep its simplistic tapered shape. It has brilliant variegated green leaves that seem to grow from the multiple knotted brown trunks. With its alluring shape and classic decorative planter, this piece will easily complement any décor setup. It'll make a great addition to your enclosed patio space or living room tucked next to your wicker side table opposite a button-tufted couch. Height: 57 In., Width: 24 In., Depth: 24 In., Color: , Pot Size: H: 15 In. W: 12 In. D: 12 In.